RUAG Space has revealed some new products that are specific to satellite constellations which are a new, low-cost series of electronics products tailored to satellite constellations presented at the Space Symposium. The company, a U.S. and European based product supplier, introduced its latest developments for both satellite platform and payload. RUAG’s new constellation series is developed to meet the new space requirements of low cost, and high performance. With the use of standard components (COTS: commercial-off the-shelf) and by driving automated processes, the product supplier has enabled high volumes of production in short periods of time. Peter Guggenbach, CEO RUAG Space stated that they want to be the supplier of choice for satellite constellations — now and in the future. While this electronics series is new, RUAG Space has been a supplier on a full range of mechanical products to constellations, and already supplies structures, thermal insulation, and dispensers for constellations. By now adding this low-cost series for electronics, RUAG Space offers a full range of products for the LEO constellation digital payload, including low-noise amplifiers, digital processors, solid state power amplifiers, as well as active antennas with beamforming networks. 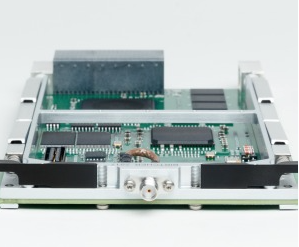 Products for the platform includes COTS based onboard computers, payload interface units, and most recently added, COTS based navigation receivers. Peter Guggenbach continued stating that at RUAG, they are ready to invest, in order to offer technology that can meet the requirements of tomorrow’s satellites. With this new electronics series, they are offering their partners an additional path to affordability of their satellites. A perfect example is one of RUAG’s core products, the computer and that it is helping to control the satellite. Several hundred computer units have flown on commercial and institutional missions, such as Iridium NEXT (payload interface unit) or the Galileo navigation network (on-board computer). By applying COTS components and automating steps in the manufacturing process, RUAG can achieve significantly less cost. Mats Warstedt, Senior Vice President Electronics at RUAG Space stated that their COTS computer has more than 10 times the performance at a fraction of the price compared to traditional computers for space. This is how they position their customers to lead the way in new space.